With five other collaborative art groups we were invited to TRADE to present myvillages.org. We spent a week in the county of Leitrim, Ireland, to present myvillages.org and took part in a series of presentations and informal discussions in The Dock, Carrick-on-Shannon. TRADE was organised by the counties Leitrim and Roscommon as a forum for exchange and swap of the practice and ideas of local artists with the guest´s ones. N55 (Denmark), 16beaver (New York), General Public Agency (UK), M&M proyectos (Puerto Rico) and Catalysts Arts (Belfast) participated in this event. 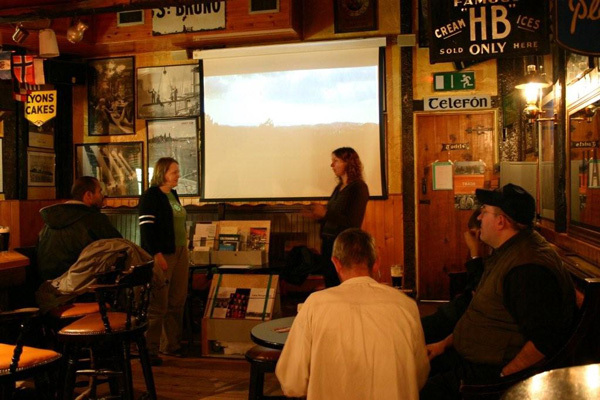 Wapke and Antje did a first presentation of the brandnew bibliobox in one of the seven pubs of the village of Drumshanbo.